It's no secret that it's often frustrating to struggle with your weight -- so much so that you might wish you could close your eyes, snap your fingers and instantly reach an ideal weight. While this scenario might be appealing, it's not healthy. Not only is it healthier to try to lose weight at a steady rate, you'll also increase your chances of being able to maintain your new, healthy weight. Set a goal of losing one to two pounds over the course of the week. At this rate, you'll lose between four and eight pounds per month, which is a healthy rate of weight loss, according to the Centers for Disease Control and Prevention. Losing one to two pounds per week requires you to create a weekly caloric deficit -- by consuming fewer calories than you burn -- of 3,500 to 7,000 calories, notes Hussman Fitness. Reaching this deficit can take place by increasing your exercise and decreasing your caloric intake. Adopt a workout regimen that includes frequent cardio and strength-training exercises. A minimum of 300 minutes of cardio and no fewer than two strength-training sessions each week can help you work toward weight loss, notes the CDC. If possible, select exercises that are convenient or that you enjoy. For example, if you enjoy visiting a gym, work toward your cardio goal on the treadmill or stationary bicycle and strength train by lifting weights. Around home, take up jogging or inline skating for cardio and body-weight exercises for strength training. Reduce your daily caloric intake to increase your likelihood of reaching a caloric deficit. An overwhelming percentage of people who succeed in weight loss and keep the weight from returning typically do so through diet and exercise, rather than one method or the other, notes the American Council on Exercise. Methods of cutting your calorie consumption include skipping alcoholic beverages, avoiding foods that are high in trans fats, and eating small meals over the course of the day. Weigh yourself each morning and note your weight in a journal. 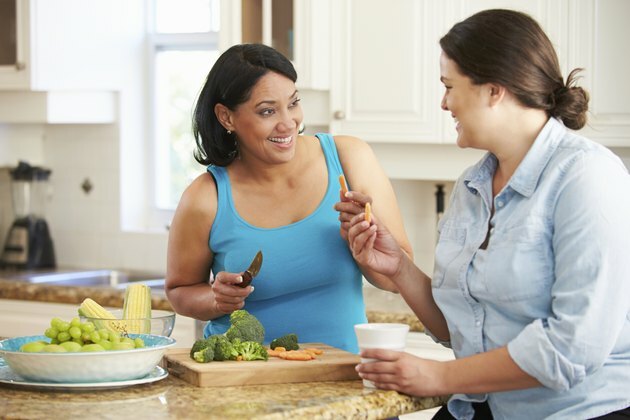 You won't likely see a significant weight change on a day-to-day basis, but checking your weight frequently can help you stay disciplined and be aware of any lifestyle changes that cause a slight weight gain. Speak to your doctor before you make significant exercise and dietary changes.